On my twenty-first birthday, we lay on our backs in the center of Plaça Catalunya in Barcelona, searching for stars that shone brighter than our city. We found none. It was June, and both he and I were in denial that I had one month and nine days left until I would return to California. It would be a double heartbreak to be separated from my first two loves: his city was my first love, and he was my second, but he had known for four months that my heart worked and loved in mysterious ways. He, the Catalan boy who had lived in the city his entire life, had not explored Barcelona or loved it the way I had. Naturally, we disagreed on a few things about our city. I could wax poetry on the precise way the mid-morning sun would hit the tall buildings while he would complain that the buses were never on time. I was forever trying to drag him to the seedy part of town that smelled like musty, greasy piss and had the coolest bars in city, but he said that the Gothic Quarter was the trashcan of the city. Yet even he had to agree that Barcelona was more beautiful through my unblinking blue eyes. “Feliz cumpleaños,” my Catalan boy said, smiling, just a few minutes after midnight. In a way, I always knew I would be the one to break his heart. I feared shouting matches, our stubborn heads butting, and unforgivable words that te quiero, te amo could not overcome. I couldn’t have known then that we would slowly burn out like oxygen-starved embers, separated by thousands of miles, an ocean, a fifteen-hour plan ride, a nine-hour time zone until we were reunited in San Francisco and realized that we didn’t fit together anymore. That chispa, that spark, was lost somewhere in our transatlantic second-love story. However, it worked out pretty well for my first love. The air in the metro was hot and electric when the doors to the yellow line swung open at Jaume I, the only metro stop that services the heart of the Gothic Quarter in Barcelona. I always thought that the buildings in that part of town stood like wounded soldiers, waiting for the rare breeze to whisper their long-forgotten stories. It was a Sunday night at the end of September, and the entire city was alive and ready to finish its last day of the festival of La Mercè with a bang—literally. The party had raged for four days to celebrate the patron saint of Barcelona. For me, La Mercè was a blur of stifling metro tunnels, running across the city to watch the night sky explode with fireworks, dashing into a bar to avoid an unexpected late-summer downpour, hunting down free museums, and dancing to music with words I knew but lyrics I couldn’t repeat. I spent those days walking down the streets that I pretended were mine, and drinking a bottomless cup of café con leche so that I wouldn’t miss a single moment. The last night of La Mercè featured fire, most notably the correfoc, which means “fire run” in Catalan. When I emerged from the metro tunnel with my friends, we heard the correfoc before we saw it. A labyrinth of streets separated my friends and me from the fire and the running, but even then we could hear the drums that sounded a deep, hellish beat which awakened the feral side of the city. The devils had come out to play: hooded figures with cackling masks leapt with crackling sparklers, calling all to join them and dance in the intoxicating darkness. The devils opened the Gates of Hell, releasing dragons spewing sparks into the streets. Explosions of sparklers filled the narrow roads, the sound reverberating off the buildings with a bang like a gunshot and the sparks burning through clothes. We didn’t dare to join the revelers in the middle of the street to dance under the sparks with the demons, nor did we dare to follow the drums and dragons through the winding streets. Even the contagious beat of the drums that matched the rhythm of our hearts could not kick aside our prudent remembrance that tank tops and shorts were not appropriate attire for correfoc unless we wanted singed hair and burned skin. I would have a second chance, though. February brought Siberian winds, a Catalan boy, and the festival of lights. At Santa Eulalia, I donned a pair of jeans, a ratty hoodie, and gloves before plunging into the heart of the old city to dance with the devils as sparks flew all around me. My feet hardly touched the ground, jumping, skipping, and twirling to the beat of the drums. A devil grabbed my hand and pulled me under a shower of sparks. There I squatted, laughing as the world around me exploded into light. The Siberian winds eventually got the point and went back to where they came from. Barcelona crawled into spring with sunshine, cold breezes, and fickle weather until summer came to stay. I turned twenty-one in the center of the city with my Catalan boy at my side and at the end of June, we got our summer solstice. 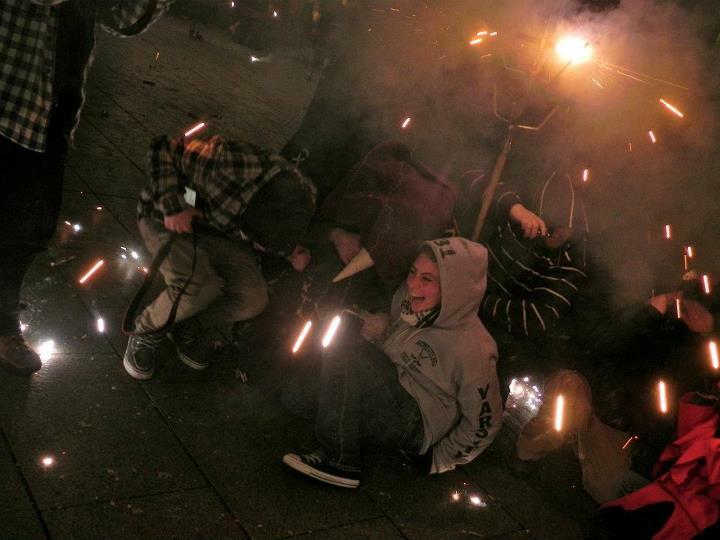 We celebrated the festival of Sant Joan by lighting firecrackers all night. Armed with a slowly burning cord and facing an unlit firecracker, I turned to my Catalan boy for help. “What do I do?” I asked in Spanish. “Light it and run,” he responded. And I did. The flame from the burning cord caught on the tail of the firecracker. When I saw the chispa had spread, I turned around and ran, arms pumping and hair flying as I waited for the firecracker to explode behind me. Tags: Barcelona, Catalonia, Correfoc, La Mercè, Relationships, Sant Joan, Spain. Bookmark the permalink. I am currently doing a program called CAPS (Conversation Assistants Programme for Schools). The program is based in Catalonia, the northeast corner of Spain below the French border. There are placements all over the region, so placement in Barcelona is not guaranteed. However, there are a ton of opportunities to work in Europe, but usually the process to get the appropriate documentation (usually a student visa) takes a bit of time. So, I would start looking as soon as possible! Good luck!